* Published: 24/10/2016 11:32:00 p.m.
We have been running a survey over a few weeks on how, now the dust is settling, people feel about the EU referendum. If you’ve travelled in France, Germany, Spain or Italy recently then you will have doubtless noticed that most places seem less crowded than England. Roads are nowhere near as busy and traffic jams and holdups far less of a problem. There is more countryside. And in the towns and cities, parks, playing fields and other open spaces seem to have survived. As a whole, the figures show that the United Kingdom is one of the most crowded countries in Europe. Only tiny countries such as Monaco, Gibraltar and the Vatican have more people packed into each square mile of land than Britain has. And, to be honest, they don’t really count as proper, independent countries. Monaco is part of France, Gibraltar is part of the United Kingdom and the Vatican is part of Italy. 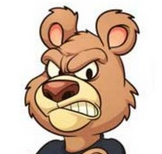 We are always on the lookout for new contributors & here is a potential new voice.The Irate Bear.